Snakes are elongate, legless, carnivorous reptiles of the suborder Serpentes. Snakes does not have eyelids and hence do not blink. They do not have external ears and hence differentiated from lizards. They are found on all continents except Antarctica. There are around 3000 different species of snake. They can have over 300 pairs of ribs. Snakes are covered by scales and their skin is smooth and dry. The scales are made up of something called Keratin, which is the same thing that our fingernails are made from. The 10 cm-long thread snake is the smallest and the Reticulated python that grows up to 8.7 meters (29 ft) is the longest. Anaconda is the thickest snake. The Black-Necked Cobra spits venom into its prey's eyes to blind it. Vine snakes have binocular vision. Snakes are carnivores (meat eaters). Snakes can’t bite food so have to swallow it whole. Snakes have flexible jaws which allow them to eat prey bigger than their head! Snakes are found on every continent of the world except Antarctica. Snakes have internal ears but not external ones. Snakes used in snake charming performances respond to movement, not sound. Snakes have a unique anatomy which allows them to swallow and digest large prey. Snakes are covered in scales. Snakeskin is smooth and dry. Snakes shed their skin a number of times a year in a process that usually lasts a few days. Some species of snake, such as cobras and black mambas, use venom to hunt and kill their prey. Read more venomous snake facts. Snakes smell with their tongue. Pythons kill their prey by tightly wrapping around it and suffocating it in a process called constriction. Some sea snakes can breathe partially through their skin, allowing for longer dives underwater. Anacondas are large, non-venomous snakes found in South America that can reach over 5 m (16 ft) in length. Python reticulates can grow over 8.7 m (28 ft) in length and are considered the longest snakes in the world. The Hognose, Grass snake and the Spitting Cobra will fake death when feeling threatened. They flip into their backs, open their mouths, and let their tongue flop out. The Black Mamba is the fastest snake in the world, reaching up to twelve miles an hour. The Black Mamba is brown, gray or olive in color and never black in color. They kill 95 to 100% of their victims. The Brahminy blind snake are all females. When mature, they lay fertile eggs, and the young are clones of the mother. Baby snakes use their teeth to break out of their eggs. They smell with their tongue. The oldest preserved descriptions of snakes can be found in the Brooklyn Papyrus. 2013 is considered the Chinese year of the Black Snake. It begins on February 10. Old belief is that finding a snake in the house will mean the family will never go hungry. Snake venom is used to make anti-venom which is used to save people from snake bites. 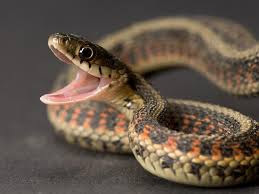 Over 100,000 people die every year due to snake bites. Snake venom is made out of a variety of enzymes and proteins.